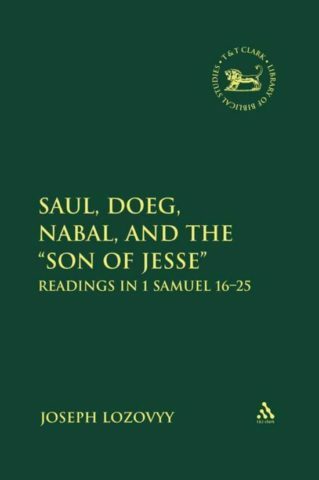 I recently finished Saul, Doeg, Nabal, and the ‘Son of Jesse’: Readings in 1 Samuel 16-25 by Joseph Lozovyy. It’s an academic book about an episode in the Book of Samuel. Lozovyy’s dissertation examines the relationships of the only characters in that book to use the phrase “Son of Jesse” as an insult: the Mad King, Nabal, and Doeg. The work also serves an an interesting foil to Dumbrell’s Covenant Theology, Mullen’s Canaanite Mythology, and Alter’s literary approach. I’m writing this because I read all of Saul, Doeg, Nabal and I found it fascinating. I liked it. But much of this review is probably “unfair.” Thank goodness no one has reviewed my dissertation by these standards! Doeg was “chief of King Saul’s sherpherds.” In the pastoral economy of ancient Israel, sheep were the major form of wealth. Ancient Israel did not have a professional police force: Doeg’s responsibility in maintaining the flocks made him like a ranhcer in the early west, or like a major drug dealer in American cities. Nonetheless Lozovyy records numerous academics who believe the text of the Book of Samuel is defective, because a shepherd would never be violent! When we first meet Doeg he is “detained before the LORD in the temple,” which may have meant he was forced to wait while the priests inspected the ritual purity of the animals. After reading Lozovyy’s explanation, I picture a powerful but nervous drug distributor waiting as a large customer inspects the merchandise. 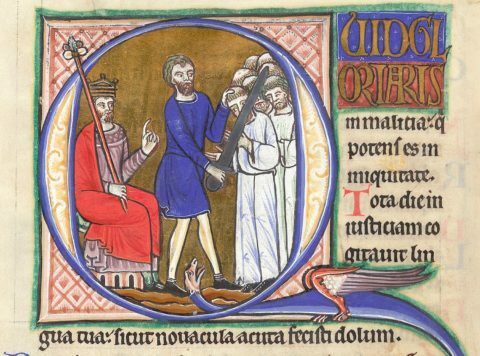 While being “detained” Doeg notices David, the prince, enter and speak to the priest. 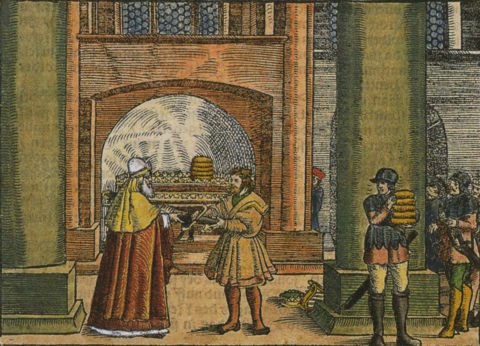 David leaves with bread and a sword. At the time, Doeg did not know that David had fled from Saul and was about to become a fugitive. What happens next is the Book of Samuel at its literary best. Neither Chief Shepherd Doeg’s report, nor Priest Ahimelech’s reply, can be compared to an objective description of the events. Like King Saul, the reader does not know what really happened. Both the Chief Shepherd and the Priest have their own reasons to both fear and flatter the king. What is actually happening in this scene? Doeg’s later actions — massacring an entire town — completely fits an amoral Western antihero, but wouldn’t fit the cartoon version of a shepherd. They also fit such leaders as (with his hardened heart) Pharaoh, and (in his later years) Moses, and the fictional Walter White. Then the king said to Doeg, “You turn around and attack the priests.” And Doeg the Edomite turned around and attacked the priests, and he killed that day eighty-five men who wore the linen ephod. And he struck Nob the city of the priests with the edge of the sword, both men and women, children and infants; also oxen, donkeys, and sheep he struck with the edge of the sword. Also interesting was Lozovyy’s discussion of a rabbinical reinterpretation of Doeg. In the second and third centuries A.D., Doeg was written about as if he were a rabbinical scholar, but one who twisted his learning for evil ends. This was probably an early, and hostile, reaction to Christianity, with Doeg presented as a forerunner to the early evangelists: a persuasive pharisee who turned his knowledge against the Temple, and seemed (in his own way) to prevail. In the New Testament, the Gospel of Mark and the Letter to the Hebrews are convincing “Jewish” arguments for the Messiah Jesus. Doeg is how such gentile Messianic Jews were seen by their enemies. Another mysterious character is Nabal, a man with “business” in Carmel. The epsiode between David and Carmel is odd, because it appears that David is simply shaking down a local landlord for money. Lozovyy argues that the count of sheep and goats ascribed to Nabal would make it clear this is not simply a landlord, but one of the very richest in Judah. Again, considering the overlap between security of sheep and military power, it’s perhaps fair to see Nabal as something between a governor and warlord. 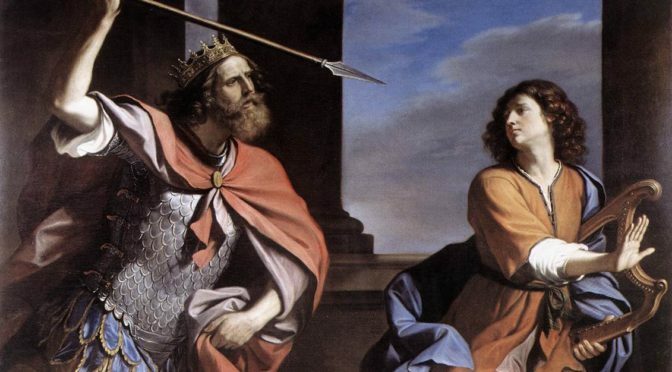 He, Saul, and Doeg are the only characters in the Book of Samuel to use “Son of Jesse” as an insult, providing a further of his connection with Saul’s legalized underworld.The story of David and Nabal was thus not (or not simply) an instance of banditry or a protection shakedown. Rather a critical episode in David’s consolidation of the south, in which he attemptd to turn a warlord through a combination of flattery and threat. 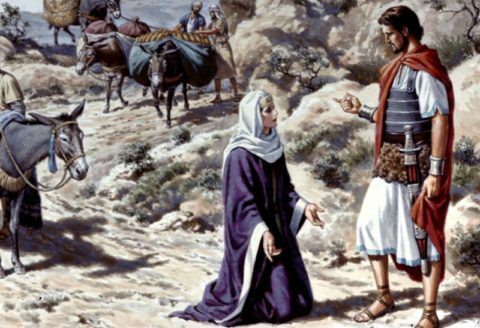 She fell at his feet and said, “On me alone, my lord, be the blame. And please let your maidservant speak to you, and listen to the words of your maidservant. Please do not let my lord pay attention to this worthless man, Nabal, for as his name is [which means Fool], so is he. Nabal is his name and folly is with him; but I your maidservant did not see the young men of my lord whom you sent. Unfortunately, it is in the discussion of this episode that the same dehumanizing view of the text in Covenant and Creation emerged. Lozovyy repeatedly claims is an intercessrix, as her prayers cause the LORD to save David’s life. But within the text, how we do know this? Only because David says it, and David (until the death of his first son) consistently says whatever is either in his own interest, or in his interest that the hearer believe. Abigail may have been an intercessrix, but the Book of Samuel (which like the Gospel of John dwells on the hidden nature of divine works) but by taking all of David’s words at face value, the reality that David was a human is lost. When David heard that Nabal was dead, he said, “Blessed be the LORD, who has pleaded the cause of my reproach from the hand of Nabal and has kept back His servant from evil. The LORD has also returned the evildoing of Nabal on his own head.” Then David sent a proposal to Abigail, to take her as his wife. … any human causation is elided over by the narrator. Which, to Lozovyy, indicates no human cause at all. Too bad. The core message of Christianity is that the Creator so loved His creation He became a creature. Thus,the dual causation in the Book of Samuel should not be a cause for an embarrassment, but a reminder of God’s presence in human affairs. I liked Saul, Nabal, Doeg, but it obvious it was a dissertation. The writing style, and even the author’s perspective, changes dramatically from chapter to chapter. I assume the dissertation had originally been written chapter-by-chapter in different seminars, and then edited together before a full academic committee. Because every professor is allowed to be a pimp in his own classroom, and each professor on a dissertation committee effectively has a veto over the student graduating, each chapter is probably a reflection of the different professor’s biases. Because Saul, Doeg, Nabal was written by an academic for academics, it reminded me a lot of The Assembly of the Gods by Theodore Mullen. But the striking difference between these books seems to reflect the differences between biblical criticism and ancient semitic literature. To the extent possible, Assembly of the Gods treats the Canaanite texts as works of art. While the pieces of the stories are clearly missing, all the characters are treated as coherent individuals whose actions and motivations are described in the text. On the other hand, the Book of Samuel is seen as a composite of many authors. The “Dumb Semite Theory” — that the Hebrews were semiliterate and were unaware when additions to their scriptures were beign made — always seems to stalk Saul, Doeg, Nabal. Speculation that this line, or that story, was added in such-and-such a century, or was redacted in such-and-such place, is rife. Almost every option is explored , except that The Book of Samuel actually is a coherent ancient text from the early Kingdom. That said, a fair comparison might be made to Biblical Games by Steven Brams. Neither properly view their texts as a work written by an author (or Author). But both focus on specific episodes in ways that provide more depth. Brams game theory is occasionally interesting, such as his discussion of what Abraham expected God to do (as the LORD had already given him a son in extreme old age, physically eaten dinner with him, and had proven himself open to intercessions). And likewise Lozovyy hints at the internal states of characters, and why actions that appear to be random or arbitrary contained clues that would have been obvious to the original audience. I enjoyed Saul, Doeg, and Nabal, but it hard to recommend. The composite nature of the work, each chapter seemingly written for a different professor and written to flatter their views, is a negative. As are the oscillations between dumb semite theory and dehumanizing covenant theology. Alter’s “literary method” (assuming the text was written by someone who understood writing) is referenced in passing, but as Alter greatly influenced my understanding both the Old and New Testaments, it was not engaged with enough to my liking. And then there’s the price. As an academic dissertation, and either costs $150 on Amazon, or for free as a PDF from the Edinburgh Research Archive. So I split the difference and read the PDF on my Amazon Kindle.